Sovereign sleeps 12 guests in 6 cabins. Super yacht Sovereign 120 foot (36meter) manufactured by Broward marine in 1993. 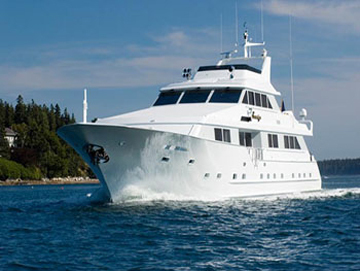 Is a exceptionally popular charter yacht because of her price to vacation value ratio. No other professional charter yacht has a lower rate for this high-end quality yacht and crew team. Maintained year round her last refit was in 2005 and each year something else is redone or replaced to keep her in great condition. Here normal base in winter is the Bahamas/Caribbean and summer months we find Sovereign in the Newport Connecticut location. On board is an exceptional internationally trained chef, so expect world class cuisine served by professionals. Meals are custom prepared for each person in your party. Well planned luxury power yacht. All cabins are all fully air-conditioned and en-suite 42 inch flat screen TV’s CD/DVD, only the twin has a 32 inch TV with CD/DVD. The master state room is magnificent, King sized bed, the latest entertainment center, walk in wardrobe with a his and hers bathing facilities. The trump card for Sovereign is that the master cabin is set on the main deck and is full width. 2 x Queen Staterooms with 42” flat screen TV’s CD/DVD, and en-suite with stall showers in each. A Stateroom with two twin-size beds, TV/CD/DVD, and en-suite stall shower are located forward. All cabins are fully air conditioned. 12 Knots is normal speed with a 16 knots maximum. 22 foot Caribe tender 115 h/p ob motor. Water skiing for adults and children. Wake board, Knee board and towing.